Hi Friends. Today's card features "Lovely as a Tree" (Stampin' Up! 's most popular stamp set of all time), the "Thoughts & Prayers" stamp and the super fun Brusho crystals! Put water into Stampin’ Sprtizer and spritz over entire front of watercolor paper. Tap a small amount of blue Brusho Crystals onto top of watercolor paper and tip paper letting crystals process and “run” until desired effect is achieved. Repeat with Moss Green Crystals. 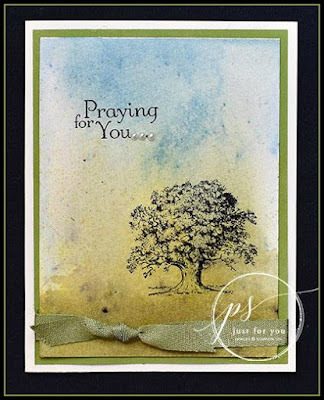 Using Black Archival Ink, stamp oak tree image from Lovely as a Tree and “praying for you” sentiment from Thoughts & Prayers onto card front. Attach stamped piece to Old Olive using SNAIL Adhesive. Wrap ribbon around bottom of piece from step 5 and tie knot. Attach this unit to card base using SNAIL. Attach 3 small pearl jewels at end of stamped sentiment. Such a pretty card. The colours blend together flawlessly.